Green bananas are not ripe yet. Yellow bananas are ready to eat. Blue bananas are currently traveling back in time. Eat one of those and you will poop it out last week. Purple bananas have magical powers and will probably turn you into a unicorn if you eat one of them. Brown bananas means you bought too many bananas. 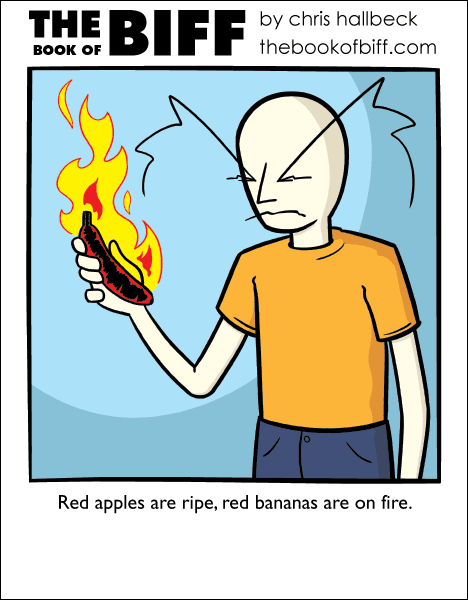 Oh, red bananas aren’t always on fire. They just have a raspberry taste to them. My store sells them every day. Orange bananas mean adjust your television set. reminds me of a Mitch Hedberg joke: bananas are like the opposite of traffic lights, green means wait, yellow means go, and red means….where the ***** did you get that banana? Also! Cuban Reds are a variety of banana that they have in Hawai’i, and probably other places like, I dunno, Cuba, and they are red and tasty! Your blurb made me laugh out loud!